Central Arizona was fantastically represented at the USTA Regional Tournament Copper Bowl, with over 20 players reaching the finals of their flight. The USTA Regional Tournament Copper Bowl took place Jan. 22-24 in Tucson, Ariz.
Hunter Johnson (Litchfield Park) and Nicholas Montoya (Scottsdale) defeated Jason Jaruvang (Phoenix) and Dominic Patrick (Gilbert) in the final round 8-1. 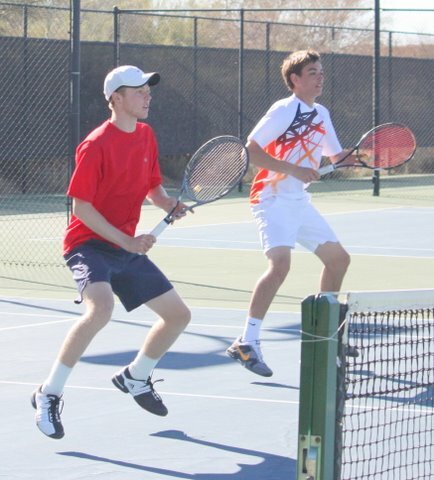 The Boys' 16s Doubles also had Central AZ representation, as Thomas Pecor (Scottsdale) and Matthew Dunn (Tucson) (both pictured right) defeated Chiu & Rosen in a tight 9-7 match. James Ponwith (Scottsdale) partnered up with Robert Seby (Oro Valley) to take first place in the Boys' 14s Doubles flight, beating Gealer and Tran 8-6. Central AZ boys in the 12s doubles flight also had a great run, with Sean Parks (Oro Valley) and Brandon Stringfellow (Phoenix) winning a tight one 9-7 in the finals against Carlos Hassey (Surprise) and Chase Victor (Scottsdale). Central Arizona boys did not back off in singles either, as Nolan Bauer (Phoenix) took first place in the Boys' 18 Singles flight, and Nichoas Montoya (Scottsdale) took third. Max Schell (Goodyear) took second place in the Boys' 14 Singles, losing a tough 3-setter to Chaz Downing. In the Boys' 12 Singles, Brandon Stringfellow (Phoenix) took fourth place, losing to Ethan Hillis in a close match. Central Arizona girls also gave great representation, as many of them took first place in their flights. In Girls' 14 Doubles, Madison Clarke (Phoenix) and Maddie Pothoff (Tucson) defetaed Alexandra Letz (Scottsdale) and Allie Sandford (Phoenix) 8-3 in the finals. Summer Garrison (Half Moon Bay, CA) and Kylie McKenzie (Anthem) took second place in the Girls' 12 Doubles, while Alexandra Inchauste (Bellevue, WA) and Regan Posorske (Cave Creek) took third place over Taylor Bridges (Mesa) and Sarianna Kuuttila (Albuquerque). In singles, CAZ girls continued to shine. Stephanie Vlad (Scottsdale) took first place in Girls' 18 Singles, beating Mariely Hassey (Surprise) 6-4, 6-1 in the final. Alexandra Letzt (Scottsdale) took first place in Girls' 14 Singles, defeating Maria Smith 6-0, 6-1, and Sara Parker (Gilbert) took fourth, folding to Maddie Pothoff 6-3, 6-2. Not to be outdone, Kylie McKenzie (Anthem) received second place in the Girls' 12 Singles flight, losing a tight match to Miachaela Gordon 6-2, 7-6(2). Congratulations to all Central Arizona players! We are proud to have you in our section and look forward to seeing your future results!